1. We determine the style of fabric (is it nylon? Olefin? Cotton? Rayon? Etc…) This is accomplished using a piece of the fabric taken from an inconspicuous area and burned in a safe location. The type of flame and odor of the smoke will determine what type of fabric is about to be cleaned. 2. A small amount of cleaning agent is applied to an inconspicuous area of the piece of furniture and allowed to set to determine if any color bleeding or browning will happen during the cleaning process. Once we know what type of fabric we’re about to clean and have determined what cleaning process will be the most effective, we are ready to clean your furniture. 1. As with carpet cleaning, a pre conditioner is applied to your fabric to suspend soils that cannot be removed by vacuuming. 2. We then agitate the pre conditioner into the fabric using a soft horsehair brush. This brush is gentle enough for your fabric, but it also works the cleaning agent into the fabric to suspend the soils. 3. Extraction can now take place. Using our powerful extraction system, we can effectively flush the soils out of your upholstery! Special Note: If your fabric is cotton, remember that it is highly absorbent and may need more effective and/or aggressive cleaning systems to bring the luster back. Sometimes the soils have absorbed into the core of the fiber where it cannot be removed. This would call for special treatment to improve the look of the fabric. Costs, of course, may vary. 4. Rinse. 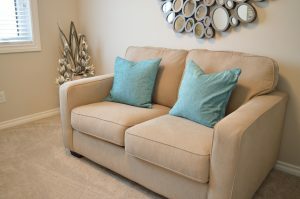 Once your upholstery cleaning is complete, we then apply a fabric rinse to neutralize and rinse off any residue in the event of any being left after cleaning. This gives your upholstery a soft, residue-free feel. The effects of upholstery cleaning will last longer depending on activity in the home.